1.3. 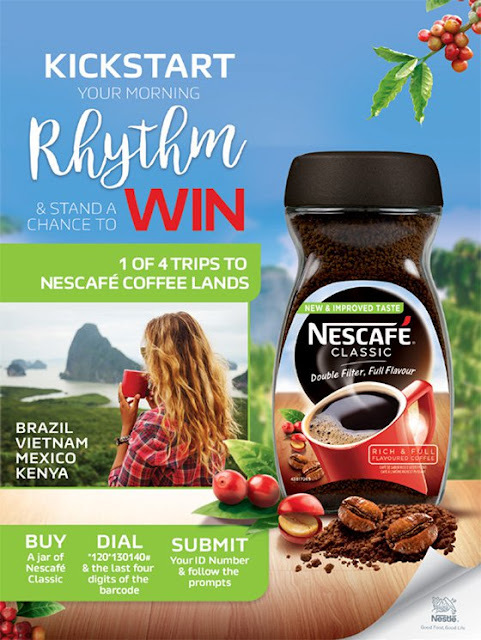 This competition is operated by Nestle South Africa (Proprietary) Limited (“Nestlé”) in conjunction with Roth Media Productions (Pty) Ltd (the “Promoters”). The Competition shall commence on 1 February 2018 and will end on 30 April 2018. No entries received after 30 April 2018 will be considered. 4.1. Buy a Participating Product, dial the USSD code *120*130140#, enter the last 4 digits of your barcode, your ID number and follow the prompts. Keep proof of purchase in order to be able to redeem your prize. 4.3. Winners will be determined by random draw that will be held on a weekly and monthly basis. Experiential Trips: Include travel, accommodation, meal allocation, transport and limited spending money. In the event that a Visa is required, this shall be for the winner’s account and sole responsibility. Nestlé does not guarantee that the winner will be granted a Visa. Airtime and data can only be loaded on pre-paid and top-up mobile accounts. 6.3. If the Promotors are unable to reach any of the potential prize winners after 3 (three) attempts made within 3 (three) working days of their name being drawn, for whatsoever reason, including incorrect telephone numbers or inoperative telephone numbers, such winner will be disqualified and a runner up finalist will be deemed the potential prize winner subject to the terms and conditions herein.